What is Mil-spec & 550 Paracord? The braided sheath has a high number of interwoven strands for its size, giving it a relatively smooth texture. The all-nylon construction makes paracord fairly elastic; depending on the application this can be either an asset or a liability.While the U.S. military has no overall diameter requirements in its specifications, in the field 550 cord typically measures 5⁄32 inches (4 mm) in diameter. 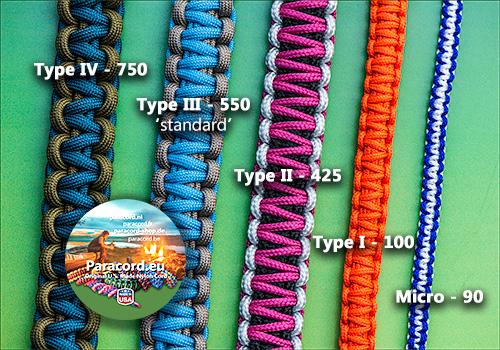 US Military issue paracord is specified by MIL-C-5040H in six types: I, IA, II, IIA, III, IV. Types IA and IIA are composed solely of a sheath without a core. Type III, a type commonly found in use, is nominally rated with a minimum breaking strength of 550 pounds, thus the sobriquet "550 cord".The US military specification for paracord outlines a number of parameters to which the final product must conform. Although it contains specific denier figures for the sheath strands and inner yarns, there are no overall diameter requirements for the cord itself.